Order online via our secure server. You will be able to download your kit immediately. 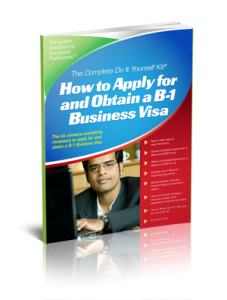 This complete do-it-yourself kit includes everything you need to apply for and obtain your Temporary Business (B-1) Visa. This downloadable kit is in .pdf format and can be viewed and printed using Adobe Reader. This downloadable kit contains fillable and editable USCIS and Department of State Forms. You will be able to complete the USCIS and Department of State forms on your computer, then print them out to use with your application at the American Embassy or Consulate. We accept MasterCard, Visa American Express and Paypal.